On March 9, the Ingersoll District Nature Club visited the Springwater Conservation Area. See our blog post to view photos taken during the visit. The Government of Ontario has set its sights on “improving” Ontario’s Endangered Species Act, posting a discussion paper on the Environmental Registry. However, the paper makes it clear that the province’s primary objective in revisiting the act is not to ensure efficient recovery for Ontario’s at-risk species but, rather, to find even more efficiencies for industries that want to operate in the spaces that species depend upon to live. Please note: The Owl Prowl has been postponed to March 3, due to trail conditions and weather. The Countdown to Earth Hour is On. The Ingersoll District Nature Club has lots of exciting events planned this year. Get all the details so you can start marking dates down on your calendar by visiting the Events Calendar page. Recently, we received an email from Ontario Nature, discussing Bill 66 (Restoring Ontario’s Competitiveness Act), which passed first reading on December 6th, 2018. If passed, this legislation would trump critical environmental protections for land, water and wildlife throughout Ontario. Learn more about Bill 66 and what you can do at https://ingersollnatureclub.com/2019/01/10/bill-66-important-updates-and-actions. Whether you choose from 9 trails in our eastern area or 10 trails in our western area, we’ve got routes to suit hikers and nature walkers of all skill levels from little feet to seasoned trekkers. Find fresh air fun, spectacular fall colours, stunning sunsets, fascinating wildlife and more in Ontario’s southwest this fall. There have been several changes to our Activity Calendar. Cancelled – October 27 – St. Mary’s Avon Trail. For more information about these and other Ingersoll District Nature Club Activities, see our 2018 Activities Calendar. Download our new Lawson Trail Map and plan your visit today. For more information on this and other events, visit our 2018 Activity Calendar. our 2018 Activity Calendar. Please note: The trip to the Pinery, scheduled for Saturday, June 23, has been cancelled due to rain. There will be no rain date scheduled. We thank everyone for their understanding with this issue. On June 13 , the Ingersoll District Nature Club Meet at the Parker family farm at 7:00 p.m. at 363341 McBeth Road (west) for an informative walk of their field and trail system, led by Terry Parker. For more information and photos from the day, click here. An article on the WWF’s website recently caught our eye, as it discusses seven species that can be found in Southern Ontario’s Carolinian region. “It’s the brightly coloured wildlife that catch our eye, the grass underfoot and the trees overhead. It’s the creatures that sing in the morning and howl at night. It’s also the little things, such as insects and micro organisms that are invisible to the naked eye. Biodiversity – the incredible variety of life – is all around us, even in our cities and backyards. Wildlife To Be Found at Lawson Tract. A visitor to the Lawson Tract forwarded a couple of photos of wildlife they observed on Sunday, May 13. One was a baby salamander (top) and the other a frog resident of the Phillips Trail marsh (bottom). 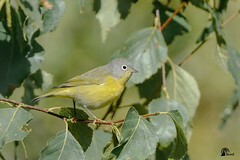 On Saturday, to mark Migratory Bird Day, the Ingersoll District Nature Club will be visiting Rondeau Park to watch for migrating warblers. For more information on this trip, visit our 2018 Activity Calendar. Updated Information Regarding Calton Marsh Event – CANCELLED FOR MAY 6! Please note: Due to weather concerns, our trip to the Calton Marsh has been cancelled on May 6! More information from Dave Baird, the event leader: The Calton evening hike on May 6 will begin at the Calton Swamp parking lot at 7:30 pm. Each participant should wear comfortable clothing, hat including waterproof boots or shoes (usually a bit muddy), plus bring a flashlight or headlamp. A snack and drink is recommended. There are ticks, so I caution everyone to be aware. The walk is generally easy but not wheelchair accessible. The sounds of the marsh can be magical for those who will take the time to stop and listen, so there will be times when everyone needs to be very quiet. Please note the new carpool time of 6:30 pm. Now make that vision a reality. Buy wildflower seeds that support pollinators! Five- or ten-packs of beautiful flowers suitable for Eastern Canada. Five- or ten-packs of bee-friendly beauties for Western Canada. A three-pack of easy-to-grow wildflowers for almost any yard or garden. Proceeds from seeds you buy will support the Butterflyway Project. You’ll power volunteer Butterfly Rangers creating pollinator pathways in Markham, Montreal, North Vancouver, Richmond, Toronto and Victoria. Thanks for helping protect pollinators. P.S. Seed sale continues while supplies last. Get yours before they’re gone! Learn more about the David Suzuki Foundation here. 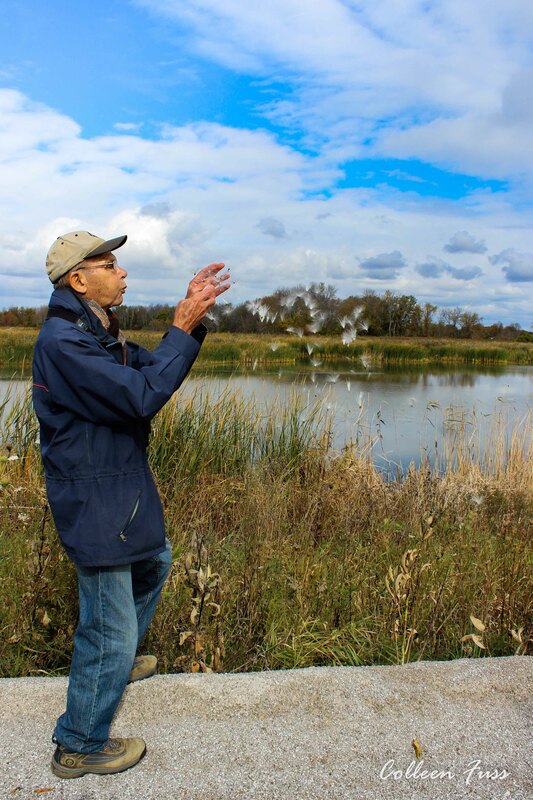 IDNC naturalist Don Bucknell dispersing Milkweed seeds into the wind, at the Port Rowan Wetlands. 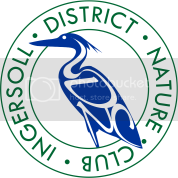 Since 1952, the Ingersoll District Nature Club has maintained an active and friendly nature community in Ingersoll. We welcome newcomers to participate in any and all activities. Join us in a nature walk or other community activity. Please see our Club Activities for details of our planned hikes and meetings through our programming year. Our group typically meets monthly, in informal gatherings, to enjoy outings in nature areas in and adjacent to Oxford County. We are interested in the development and preservation of nature in Oxford County, and are formal stewards of the 36 acre (15 ha) Lawson Nature Reserve, south of Ingersoll. Stewarding the Lawson Nature Reserve – invasive species management, hillside restorations, trail maintenance, signage, etc. So please, take a look around our site. You can see what we are all about, the activities that we offer, our signature trails and more. If you’re interested in becoming a member, you can click here. Also please find IDNC articles and content in the OPAL Newsletter published by Oxford People Against the Landfill. If you have any questions, comments, or feedback, we would love to hear from you.